TORONTO , Feb. 20, 2019 /CNW/ - Anaconda Mining Inc. ("Anaconda" or the "Company") (ANX.TO) (ANXGF) is pleased to announce the results of a 3,434-metre drill program that began in November, 2018 and included drilling around the Pine Cove mine (Exhibit A and B) and the Stog'er Tight mine (Exhibit C) ("Pine Cove" and "Stog'er Tight" respectively) at the Company's Point Rousse Project in Newfoundland ("Point Rousse"). A total of 33 drill holes (the "Drill Program") successfully infilled and extended mineralization near the margins of the existing pit outlines at both mines, as part of an on-going evaluation of potential pit expansions at both Pine Cove and Stog'er Tight. 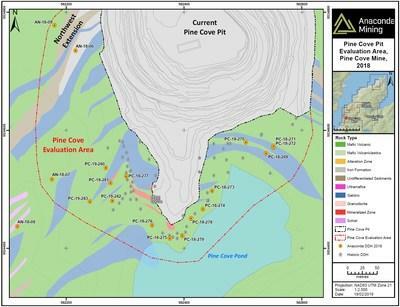 Anaconda extended the strike of the shallow, southern end of the Pine Cove Deposit, by approximately 100 metres, and extended mineralization in the Northwest Extension of the Pine Cove Deposit by 75 metres. At Stog'er Tight, the Company confirmed mineralization, including visible gold occurrences, adjacent to the ultimate pit design, down dip of the current mineral reserves. 2.46 g/t gold over 8.0 metres (79.8 to 87.8 metres) in hole BN-18-292. 1.50 g/t gold over 5.0 metre (10.0 to 15.0 metres) in hole PC-18-269. "We are very pleased with the step-out drilling done at Pine Cove and Stog'er Tight. Based on historical drilling and the current drill results, we see the potential to continue mining on the southern and western side of the Pine Cove pit without compromising our tailings storage activities. In addition, we are encouraged by the possibility of adding more ore on the northern portion of the Stog'er Tight Deposit. In the coming weeks, we will incorporate these drill results into our resource models and determine whether we can extend the mining operations at Pine Cove and Stog'er Tight beyond our existing mineral resource plan." 6.11 g/t gold over 5.0 metres (31.3 to 36.3 metres) in hole PC-92-107. A table of selected composited assays from the Drill Program is presented below. In addition to the drilling adjacent to the Pine Cove mine, the Drill Program included 1,812 metres in 12 diamond drill holes (AN-18-06 to 17) to explore the area between the Pine Cove mine and the Anoroc Prospect located approximately 800 metres southwest of the Pine Cove Deposit. Historic channel sampling and several historic diamond drill holes at Anoroc, including 9.92 g/t gold over 2.0 metres in hole AN-90-01, had previously intersected host rocks, alteration and mineralization similar in style and character to those of the Pine Cove Deposit. Drilling at the Anoroc Prospect intersected Pine Cove-like alteration and, locally, low grade mineralization, including 1.11 g/t gold over 5.5 metres (AN-18-13), but did not encounter significant assays to justify further exploration work at this time. The company would like to thank the Department of Natural Resources, Government of Newfoundland and Labrador to their assistance in portions of the 2018 exploration drill programs through the support of the Junior Exploration Assistance Program. Reported mineralized intervals are measured from core lengths. Intervals are estimated to be approximately 80-100% of true widths. Anaconda Mining is a TSX and OTCQX-listed gold mining, development, and exploration company, focused in the prospective Atlantic Canadian jurisdictions of Newfoundland and Nova Scotia . The Company operates the Point Rousse Project located in the Baie Verte Mining District in Newfoundland , comprised of the Stog'er Tight Mine, the Pine Cove open pit mine, the Argyle Mineral Resource, the fully-permitted Pine Cove Mill and tailings facility, and approximately 9,150 hectares of prospective gold-bearing property. Anaconda is also developing the Goldboro Gold Project in Nova Scotia , a high-grade Mineral Resource, subject to a 2018 a preliminary economic assessment which demonstrates strong project economics. The Company also has a wholly owned exploration company that is solely focused on early stage exploration in Newfoundland and New Brunswick .